The springs, which were in use thousands of years before Columbus' voyage' are located at latitude 30 and longitude 102, on the northern part of the ranch. The springs are shown on several old maps and were often used by the army. In 1850 Lieutenant Nathaniel Michler stopped here while exploring routes to the West. In 1885 the remains of an abandoned Indian village could still be seen near the springs. There are many Indian mounds remaining on the ranch to this day, and we still find a few arrowheads here and there. The springs still flow ocassionaly when enough rainfall allows the formation to recharge. After a really hard rain the springs will sustain a pool of water about 3 feet deep and 12 feet across. The springs overflow into a dirt stock tank which was built adjacent to the springs. The tank is channeled to a narrow dipping vat which was used by our ancestors to dip livestock for the prevention of parasites. This part of the country is usually in some stage of drought so we are always grateful when the springs flow. In September of 1996 we received 13 inches of rain in a 10 day period of time which caused the springs to flow through the winter. The springs have flowed a few times since then, most prolifically in May of 1999 after we received 11 inches of rain, and October, 2000 after 8 inches of rain. 2004 was a record rainfall year for most of the west Texas area and we received about 30 inches of rain and the springs were very active. The Pecos Land and Cattle Company was organized in 1884 by investors from Attleboro, Massachusetts. Headquarters were located near Meyers Spring, seven miles east of the railroad station at Dryden in south central Terrell County, Texas. Although the owners had no experience in ranching, they bought 106 checkerboard sections, or 67,840 acres, of land from the Galveston, Harrisburg and San Antonio Railway for a dollar an acre. In 1884 the company purchased a nearby recently established ranch, the King Spring Cattle Company. Sometime later the company added the cattle of the KL brand and the O Bar brand to its holdings. The headquarters were then moved to Dryden where the management built three structures north of the railroad and opposite the depot. In 1886 W. W. Simonds, general manager of the ranch, patented the section of school land where the townsite of Dryden was laid out. He built a large two-story building for a store, a post office, and sleeping quarters. Two adobe buildings were constructed near the store. One of these was home to the family of ranch foreman Daniel G. Franks. One of the problems the management of the ranch faced was that of providing water for the large herds. They leased land surrounding Cedar and Meyers springs from John L. Bullis, and water was also taken from King Spring and the Rio Grande. The company eventually resorted to drilling and found water at 600 feet. A second problem in operating the ranch was that of rounding up the cattle. The company began roundups at the mouth of the Pecos River and drove towards Dryden. Area ranchers who joined in the roundups to separate their cattle included H. C. Tardy, John R. Billings, Joe Kincaid, George Miller, Bob and Ross Neighbors. After "the works" all stock was driven to home range or to market. In the spring of 1886 the Pecos Land and Cattle Company gathered 2,027 calves for sale. Although the ranch showed a profit in good years, it lost money in poor ones. The owners had chosen to enter ranching on a large scale at the end of the open range. They paid top dollar for land, whereas earlier cattlemen had used free grass to build fortunes. In 1892 D. R. Baret moved from Atlantic City, New Jersey, to replace Simonds as general manager of the company, but the company was already fading by this time. In 1895 the company was dissolved and N. G. (Grover) King bought thirty-two sections of the original land for thirty-two cents an acre. It is said that Grover King had the best horses, cattle and sheep in the county during the time that he was ranching in Terrell County. After losing his wife when she died giving birth and losing his daughter to a childhood disease, he loaded up the buckboard with all of his personal belongings and drove the team 20 miles southeast to Dryden. We're not sure who he sold the ranch and livestock to, but legend has it that Mr. King took the train to San Antonio and went on to develop and patent a mechanical bosal (a horse training headstall). Dr. Augustus W. Clayton was the country doctor in Ozona, Texas at the turn of the century. 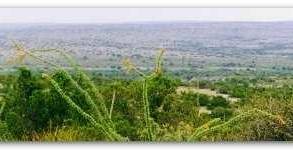 He bought The Turkey Roost Ranch, East of Ozona in Crockett County in 1896. He also established the San Angelo Medical and surgical clinic in 1929. His son, Boyd Clayton was born in 1900 and came of age and took over operation of Turkey Roost. Boyd also acquired more land in Pecos County (now part of The Bunger Cameron Ranch)and a University lease West of Ozona named The Big Mill Ranch. In 1941 a young man named Boyd Baker (Mr. Clayton's name sake)was looking at a ranch that was for sale and wanted Mr. Clayton's opinion on the property. After touring the property, Mr. Clayton liked what he saw and bought King Springs Ranch and all of the livestock from a man named Howard Roberts. Boyd Baker asked him why he bought the ranch out from under him and Mr. Clayton is said to have responded, "Well, you're a young man, you've got plenty of time to find another good ranch." Boyd Clayton ran livestock on the ranch until the early 1950's when he leased it to F.M. and May Helen Wood so that he could concentrate his efforts on The Turkey Roost Ranch and The Big Mill Ranch. The Woods worked the ranch into the 1970's. 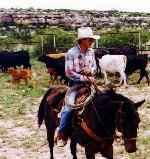 King Springs Ranch was also leased to Gilbert Bell, a neighboring rancher during the early 1970's through the mid 1980's. Boyd Clayton passed away in 1972 and his son Mike took over operations of the family ranching interests. Mike operated the ranches until his death in 1995. The ranch has passed to another generation and is now operated by Tom and Debra Ezell. King Springs Ranch is owned by Mike Clayton's daughters Lisa Garza, Lori Ward and Debra Ezell. 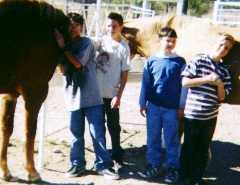 The grandchildren of Mike and Carolyn Clayton (Arron Garza, Brandon Logan, Bryce and Blaine Ward, Chance and Cade Ezell) are the fifth generation on The King Springs Ranch. Our spring round-up is in May to coincide with Memorial Day and our fall round-up is in September to coincide with Labor Day. We allow guests who have their own horses to saddle up and make a hand when we work cattle. If you would like to participate in a sho-nuff Texas cattle round-up you're more than welcome. The works take about four days and the cost is $500 per person with meals and lodging provided. All cowboys and cowgirls must furnish their own horses, tack and feed. BYOB and BYO guitar too because we've been known to pick and grin a little. There are ten miles of dirt road between the highway and headquarters and most of it is pretty rough so no foreign cars are allowed. Except maybe Toyotas with a whole lot of clearance. We offer nature tours during the months of June and July for groups of at least 4 and no more than 10. The cost is $500 per person with lodging and meals provided. The tours consist of pre-dawn breakfasts and early morning hikes and wildlife viewing to locations where Indian artifacts may be hunted. Around mid-day we will wind up back at headquarters for a hearty lunch and a little rest or bird watching. Late in the afternoon we will take another hike and arrive back at headquarters just before dusk for a big dinner and star gazing at night. Plan to arrive Friday evening for dinner and guitar pickin' around the campfire. You will depart on the following Monday after breakfast. A 25%, non-refundable deposit is due one month before the date booked and the remainder is due in cash prior to departure.